Responding to reports that President Trump overruled intelligence agency recommendations on security clearances, two senators on Thursday introduced a bill that would “protect the integrity” of the process against politicization. Observers predicted it would heighten long-standing tensions over the prerogatives of the executive branch and Congress. The Integrity in Security Clearance Determinations Act, unveiled in draft by Sens. 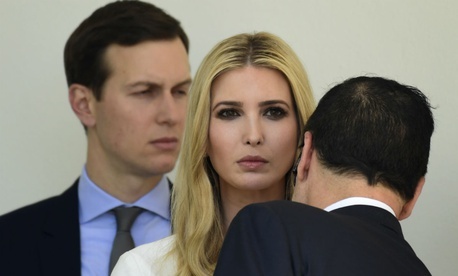 Mark Warner, D-Va., and Susan Collins, R-Maine, came just days after House members demanded documents from the White House along with a Justice Department response to reports that Trump advisers Jared Kushner and Ivanka Trump were given clearances even though their background checks had raised concerns and intelligence officials had recommended against it. President Trump has denied interfering with security clearance determinations, though he did revoke the clearance of former CIA Director John Brennan, a frequent critic. It comes after the administration reorganized the security clearance background check process to move supervision from the Office of Personnel Management to the Defense Department. And last year Congress passed the SECRET Act requiring more frequent reporting to Congress. The bill was welcomed by whistleblower advocates. “A retaliatory security clearance revocation can be a whistleblower’s professional death sentence,” Irvin McCullough, a national security investigator for the nonprofit Government Accountability Project, told Government Executive. But in perhaps a sign of coming resistance, the authority of the president and presidential appointees in security clearance decisions was stressed in a Friday Wall Street Journal op-ed by pundit and former CIA case officer Reuel Marc Gerecht. “Security-clearance decisions and procedures within an administration are inevitably subjective and sometimes maddeningly arbitrary,” he wrote. Kel McClanahan, a specialist in the area as executive director of National Security Counselors who consulted with the senators on the bill, foresees “a massive fight, and all sorts of veto threats, if it does pass,” he told Government Executive. Citing past litigation over clearance denials and a murky 1988 Supreme Court case Department of the Navy v. Egan, he points to a long-standing clash between a Congress reluctant to interfere in security clearances decisions by civil service authorities and the president’s authority as commander in chief under Article 2 of the Constitution. Correction: Irvin McCullough is a national security investigator for the nonprofit Government Accountability Project, not the Government Accountability Office as originally stated.